Holiday Extras are all about making your trip as easy as possible. Research shows that most people consider their holiday to start from the moment they set off for the airport, so why not start it without the stress of the early start, the busy rush-hour traffic and the hunger pains. By staying overnight in one of our Heathrow airport hotels you can wake up close to Heathrow, have time for breakfast and don't have the worry of being late. Below is a list of the hotels we have within the perimeter of Heathrow. There are 2 hotels within the airport's perimeter. Both of them are pretty good candidates. Staying so close to Heathrow does come with a slight premium but we believe it's worth it. 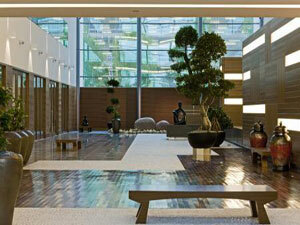 As well as being contemporary and stylish, these hotels are within walking distance of the terminal. They really do allow you to start your holiday early and with ease. Check out further details below. Plush is just one word that describes the Sofitel Heathrow. This exquisite 5-star hotel is connected to Terminal 5 by a covered walkway. The Sofitel Heathrow's not short of facilities either. There's three restaurants, two bars, 45 meeting rooms, a spa with five treatment rooms, 24-hour gym, relaxation room, hydro suite, sauna, aromatherapy steam room and vitality pool. If you're driving to the airport, you can book the Sofitel Heathrow and include your holiday parking too. What's more, your car is parked at the hotel while you're away, so not only will you be a stone's throw away from Terminal 5, you won't need to take your car anywhere else. Just four minutes from Terminal 4 stands the impressive Hilton Heathrow. This 4-star hotel is connected to the terminal by a covered walkway, so you can simply walk to check-in. Rooms are jam-packed with facilities and have soundproofing, blackout curtains, air-conditioning and a queen size bed. You're almost certain to get a great night's sleep. You can enjoy an evening meal in one of the three restaurants, indulge in your favourite tipple in the bar, or take a dip in the hotel's heated indoor swimming pool. There's even an artificial beach by the pool and a beach bar. Getting into the holiday spirit couldn't be easier.